Pizza Pan Hot Pad -- $1.99 A Crochet pattern from Julie A Bolduc. 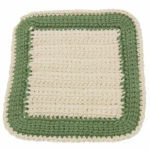 This hot pad is a direct result of a request from one of the JPF Crochet Club members. She mentioned she found a pattern in a magazine that looked like a pizza and was big enough to put a pizza pan on.